Frenemies: Donald Trump and Xi Jinping shake hands in Beijing on November 9, 2017. 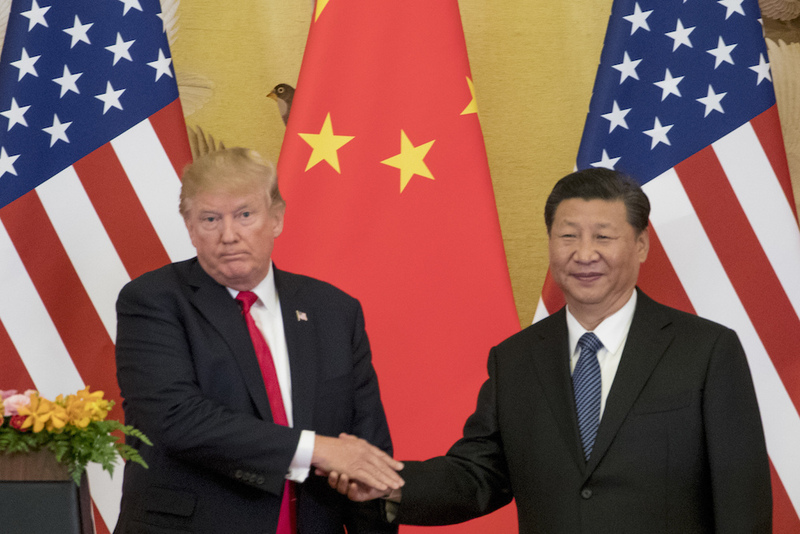 Relations between the U.S. and China have deteriorated as the countries slide toward a full-scale trade war. Photo by Andrew Harnik/Associated Press. In a truly iconic scene from the 1980s comedy Ferris Bueller’s Day Off, a high school economics teacher played by Ben Stein fails to elicit even a muscle twitch from his seemingly catatonic pupils as he queries them—“Anyone…Anyone?”—about the Hawley-Smoot Tariff of 1930. Hilarious as this scene may be in the film, it recurs frequently in real life, not simply in classrooms but in many other settings, whenever the subject of tariffs comes up. It is both ironic and unfortunate that many Americans find tariffs too boring to care about when, as our history shows, their most critical consequences—nationally and globally—are often wholly unanticipated. One of the first major pieces of legislation enacted by Congress after the ratification of the Constitution was the Tariff of 1789, which, with import duties averaging about 8 percent, was meant to raise revenue for the new republic while safeguarding New England’s nascent manufacturing economy. But even then, rumblings in the Southern states about protecting one regional economy to the detriment of another showed that tariffs could become a serious source of sectional friction, and so they did, as overall tariff rates shot up to roughly 25 percent by 1820. At that point, Northern manufacturers were clearly benefiting from protections against competition with foreign imports, while the Southern cotton, rice, and tobacco planters who accounted for more than two-thirds of the value of all American exports were doubly disadvantaged by the tariffs. Not only were they paying tariff-inflated prices for the implements and supplies needed to produce their crops, but they were also forced to sell them in foreign markets depressed or rendered hostile by American import duties. The controversy came to a head after the Tariff of 1828 jacked up rates to 50 percent on certain goods likely to compete with New England manufacturers. Though he was then serving as Vice President of the United States, South Carolina’s John C. Calhoun was so outraged by federal laws that blatantly protected the interests of a single region at the expense of his own that he moved to have both the Tariffs of 1828 and 1832 declared “null and void” within his state. There were even threats of secession if federal authorities sought to enforce the tariffs. But when President Andrew Jackson secured congressional authorization to take military action, if need be, to ensure collection of the import duties, South Carolina backed down. At that point, sectional clashes over tariff policies seemed more of a direct threat to the Union than disagreements over slavery. This had changed by the election of 1860, when Republican opposition to further expansion of slavery was the critically polarizing issue, but the party’s platform also promised formidable tariff protections for industry and trade that were likely to benefit the North more than the South. The Republican commitment to tariffs did not falter during the Civil War and became a staple of GOP politics well into the 20th century. Though proponents lauded tariffs as forces for prosperity and stability, rising rates helped to spark third-party insurgencies by American farmers in the 1880s and ‘90s. U.S. tariff policy also sowed the seeds of revolution abroad. When the McKinley Tariff of 1890 removed duties on imported raw sugar and granted subsidies to domestic producers, it destroyed the advantages enjoyed by Hawai‘i’s sugar planters under previous preferential trade agreements. In response, the powerful American owners and investors who dominated this industry began to agitate for U.S. annexation of Hawai‘i, which would automatically qualify their sugar for the subsidy and immunize it from future tariffs. Formal annexation would not come until 1898, by which time American-led insurgents had succeeded in overthrowing the indigenous Hawaiian monarchy. Meanwhile, the stage had been set for the Spanish American War by Spain’s attempts to quash a popular uprising in Cuba. That uprising had been fueled in no small part by the economic hardships imposed by the Wilson-Gorman Tariff of 1894, which cut sharply into American purchases of Cuban sugar by abruptly restoring import duties of 40 percent. The Democratic resurgence under Woodrow Wilson between 1912 and 1920 brought lower tariffs and an income tax that made tariff duties less critical to federal revenue. When Republicans regained power after World War I, however, protectionism was again the order of the day. The Fordney-McCumber Tariff of 1922 was supposed to stimulate recovery from a postwar economic downturn. In reality, its extended duties on agricultural imports actually cost American farmers dearly in already depressed European markets. At the same time, its higher duties on many other imports denied war-ravaged European nations precious income from trade that they needed to boost their economies and repay the U.S. for loans and credits issued during World War I. The new tariff law made recovery doubly difficult for Germany, which bore the additional burden of making punitively high reparation payments to its former adversaries. The Fordney-McCumber Tariff was hardly responsible for all of Germany’s woes, but it exacerbated the sustained economic distress and public discord that paved the way for the ascension of Adolf Hitler and the Nazi Party a decade later. It is both ironic and unfortunate that many Americans find tariffs too boring to care about when, as our history shows, their most critical consequences—nationally and globally—are often wholly unanticipated. Things got no better at home or abroad when Congress reacted to the onset of the Great Depression with the record-high rates of the Hawley-Smoot Tariff of 1930, which confronted already struggling American farmers and manufacturers with yet another round of retaliatory tariffs and depressed overseas markets. Meanwhile, as the value of American exports to Europe fell by 67 percent between 1929 and 1932, a proportional drop in the value of European exports to the U.S deepened the economic uncertainty that made fascism seem less threatening than communism to many, and heightened the political risk of diverting scarce government funds from welfare programs to national defense. If it was difficult to foresee all the potential ramifications of tariffs nearly 90 years ago, it’s even harder in today’s more complex and intertwined global economy. The increasing mobility of industrial capital and technology and the segmentation of production have substantially reduced the significance of national boundaries or affiliations for major manufacturers. President Donald Trump now proposes to reverse this trend—or at least shake his fist at it—by espousing an aggressive economic nationalism that has already left some corporations pinned down in a tariff crossfire. The nation’s leading automotive exporter by value is a BMW manufacturing facility that opened in 1994 near Spartanburg, South Carolina, where it now accounts for 10,000 jobs and 1,400 vehicles (primarily SUVs) per day, roughly 70 percent of them destined for foreign markets. After flourishing for a quarter-century, BMW’s South Carolina operations now seem to face cloudy future. Trump’s threatened tariff on imported auto parts, which account for roughly 70 percent of what goes into BMW’s SUVs, would inflate production costs. Also, roughly one-third of the BMW vehicles assembled in Spartanburg go to China, which has boosted tariffs on American-made vehicles to 40 percent in retaliation for Trump’s increased duties on Chinese imports, forcing the company to announce 4 to 7 percent price increases on some of its China-bound SUVs. China has long maintained a trading advantage over the U.S. by strategically devaluing its currency in order to hold down the prices of its exported goods. Ironically, since Trump announced tariffs on Chinese imports, the yuan has fallen to an 11-year low against the dollar, helping to keep those imports cheaper for American consumers and, temporarily at least, blunting some of the effects of Trump’s tariffs. The yuan cannot be allowed to fall forever, of course, especially with China’s massive debt bubble threatening to burst. Beyond that, a sustained trade war featuring higher U.S. tariffs on more Chinese goods would take a much bigger bite out of China’s GDP and dampen its growth rate significantly. What is bad for China isn’t necessarily good for the U.S. or the rest of the world, however. As the largest national consumer of foreign-made products, China has been projected to account for nearly one-third of all economic expansion between 2016 and 2021; so if it should sink into a major recession, the effect on the global economy may be more toxic than salutary. Smaller “emerging market” economies around the world can be affected more critically by tariffs imposed by major trading nations. President Trump’s ostensible effort to force the release of an American hostage by doubling tariffs on steel imported from Turkey has dramatically accelerated the decline in value of the Turkish lira. This has rattled many emerging market investors, including the Tennessee Consolidated Retirement System for public employees, which is the largest institutional shareholder in a Turkey Exchange-Traded Fund that has lost half its value since the year began. If Trump’s tariffs are more than a temporary ploy and really here to stay, a depressed market for exports and higher prices for U.S. consumers are the devils we can expect. But, as our history with tariffs makes abundantly clear, it is the devils we don’t expect that might do the most damage, both at home and abroad. James C. Cobb is a contributing editor at Zócalo Public Square and Spalding Distinguished Professor of History Emeritus at the University of Georgia. His latest book is The South and America since World War II.